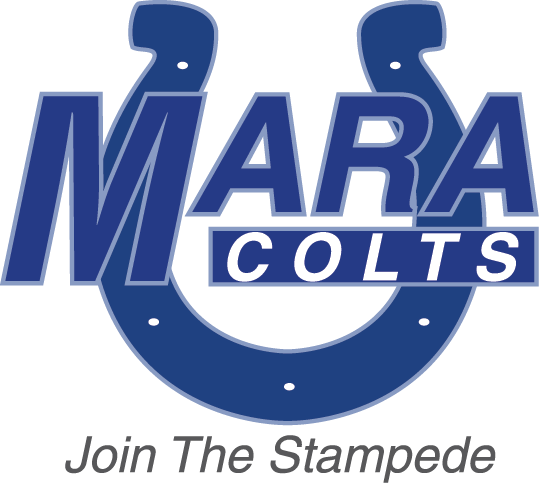 The Matthews Athletic & Recreation Association (MARA) Colts offer five divisions of play. The following age and weight matrix is designed to maximize safety while allowing players of similar size and age to compete in tackle football. All Pop Warner Little Panthers affiliated associations, in the greater Charlotte area, use the same age and weight matrix. *The asterisked provisions in each division allow the so-called "older but lighter" player to also qualify. The last year of eligibility falls under more stringent weight restrictions, per above. Weight requirements for Pop Warner are safety features unique to youth football in this area. There is a pre-season weigh-in of every player conducted by volunteers from the Mecklenburg Optimist Club, and then players are weighed before each game. Weight maximums are adjusted during the season. The maximum weight allows a player to grow one pound every other week after the first game and a total of four (4) pounds for the season. Pop Warner is growing in Mecklenburg County. In 1994 Pop Warner had 23 teams. This year they are planning on over 150 teams, representing associations from all over Mecklenburg county and beyond. With an average of 28 players per team, over 4,300 children will participate in football this year and over 600 children will participate in cheerleading. Certification is an important part of the process. Certification is when the league volunteers check paperwork on every child and weigh every child to be sure that they are eligible to play in a particular age and weight division. Every birth certificate, doctor's physical, parent consent and report card is checked. Scholastics are important to Pop Warner. The philosophy of Pop Warner Little Scholars, Inc. is that athletics and academics go hand in hand. This is why players must show scholastic eligibility to play, and why teams are are limited in their practice time. Mitey Mites can only practice twice per week after Labor Day, and the other divisions can only practice three times per week, with practices limited to two hours (exclusive of breaks). There are National and Local Rules which govern the League. Special rules exist for the Mitey Mite division such as no blitzing, no rushing kicks and allowing a coach on the field to assist players during a game. Coaches in all divisions must comply with a National Code of Conduct and have received instruction locally on other guidelines to make the experience positive for the players. The playing schedule for the season runs from the first Saturday after Labor Day through the second Saturday in November. The actual game schedule cannot be put together until all teams are certified and it is known exactly how many teams have qualified with the minimum number of eligible players required under the rules. The playing schedule will be developed over the Labor Day weekend and distributed shortly thereafter. Parent participation is an important part of the success of our league! Each team will need a team representative. This person helps coordinate paperwork for certification plus provides information to the parents. Must play rules exist to maximize play time of each player. Players on teams of 16-25 players will play at least 10 plays per game, players on teams with less than 26-30 players will play at least 8 plays per game, and players on teams of 31-35 players will play at least 6 plays per game; also in the first half a player can play only offense or defense. A play is defined as a play from scrimmage on which no penalty occurs, and does not include kicks, punts or extra points. To make this rule work, parent volunteers (two from each team in each game) are needed to record plays on the must play form. Please contact Deon Boswell, MARA Football Commissioner, at footballcommissioner@maracoltsfootball.com or Kurt Hoffer, MARA Pop Warner Athletic Director, at athleticdirector maracoltsfootball.com. if you have any questions.